When it comes to costs, printers are like razors. Just like you end up paying more in razor blades than you do for the razor over the life of a razor, you typically spend more in toner or ink cartridges than you do for your printer over its lifetime. PretonSaver Home Edition ($20, limited free trial) helps you cut the costs of toner and ink, potentially by a significant amount. 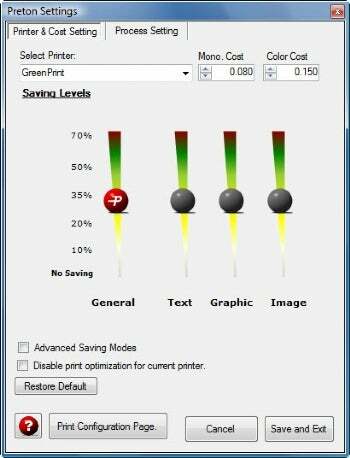 PretonSaver helps you reduce the amount of ink or toner your printer uses. Run the program, then tell it the toner or ink savings level you want--anywhere from 0% to 70%. After that, just print your pages; you don't have to do anything else. You'll have to balance savings with print quality. I found 35% to be a happy medium. Print quality degrades only slightly at that level, and you still get reasonable savings. You can also use Preton Home Saver to fine-tune toner savings. You can, for example, have text print with more toner than images. Preton Home Saver also shows reports on your savings, showing how much you've saved, total printing volume, and so on. Understand that the program won't save on paper, only on toner or ink. If you're looking for a program that will reduce paper costs, check out Green Print Home Premium. You can also use the two programs in concert: Preton Home Saver to save on toner, and Green Print Home Premium to save on paper. Note: This program is available in a one-year and a lifetime license. The price given here is for a one-year license.